Colombo’s leading boutique property Residence by Uga Escapes, welcomes Australian-born, world renowned Chef Mathew Macartney. Colombo’s Residence by Uga Escapes together with Chef Mathew Macartney hosted a curated wine dinner from 09th- 11th August, 2017 at their acclaimed restaurant, Rare. The event which was open to all, was sold out, with tickets priced at 15,000.00 LKR each. It also consisted of carefully and skilfully crafted gastronomical experiences spread across each evening. Guests were treated to a variety of dishes packed with flavour and an array of colours, to sample with a side of complementing wine. Some of the wines included in the menu were Italian Prosecco, Chilean Sauvignon Blanc, South African Rosé and Argentinian Viognier. The dishes were works of art as much as they were culinary marvels, with the likes of Shiso Cured Canadian Wild Salmon with Kohlrabi, Oysters, Passionfruit and Roasted Sesame, Spiced Caramel Glazed Pork Belly with Celeriac Remoulade and Honey Crisp Apples, Roasted Salt Grass Lamb with Crisp Mint Hollandaise, Boulanger Potato and Organic Vegetables, and to round it off, Rose Geranium Gelato. Chef Macartney himself first got his start as an apprentice at Café Cuccina in South Yarra which specialises in Italian cuisine. 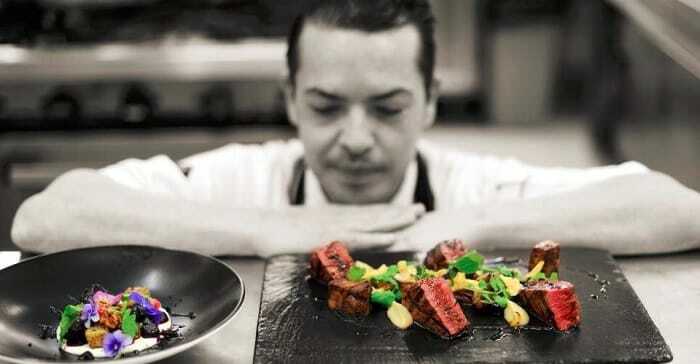 Following 3 years of training where he acquired essential skills and expertise as a young chef, he was then presented with an opportunity to work under Raymond Capaldi and Marcus Moore at Hotel Sofitel. Here, Macartney was actively involved in a range of culinary events, working hand-in-hand with industry leaders who would shape his career to come. Over the years, Macartney travelled the world, including countries such as Fiji, New Zealand and Dubai. Following many awards and accolades, Macartney most recently opened Char Dining in the leafy suburb of Balwyn (Melbourne, Australia) in 2016. The aim is to offer a convenient, high quality suburban bistro for culinary enthusiasts to hop into whenever they feel like it. Macartney’s next big project is slated for 2017, where he will be overseeing the kitchens at the newly redeveloped Village Belle Hotel in beautiful Saint Kilda. The hotel which is scheduled to open later this year, is set to be a vision, encased in a double-storey glass winter garden and complete with an open kitchen. Uga Escapes is a fully owned subsidiary of the Finco Group. Incorporated in 1963, the group comprises of several companies recording success in diverse fields. The company owns boutique properties offering unique experiences across the island that include- the 20 luxury villa Ulagalla in Anuradhapura, Jungle Beach, Trincomalee, and Uga Bay, Pasikudah, Residence by Uga Escapes in the heart of Colombo and the latest addition, Chena Huts in Yala. Rare at Residence is a creative take on modern international cuisine with an emphasis on Sri Lankan ingredients. The dishes all have a gastronomic flair, each unique in its flavour, aroma and presentation. Experience a culinary tour de force unlike any other, at one of the best restaurants in Colombo with fine dining that is both inspired and inventive. Residence by Uga Escapes is a sophisticated boutique hotel, conveniently poised in the heart of Colombo – Park Street and rated No.1 on TripAdvisor. Bearing 11 luxury suites, Residence is every travellers’ delight, with its elegant, contemporary and sumptuous setup for both long and short stays. It hosts Colombo’s premier restaurant ‘Rare at Residence’, placed amongst the top restaurants in the city. ‘Rare’ is open for breakfast, lunch, high tea and dinner, and is a premier choice for private functions and celebrations, with its spectacular, enticing facilities offering indoor and al fresco dining. Rare at Residence by Uga Escapes is located at 20, Park Street, Colombo 02. For more details you can visit www.rareatresidence.com, or call 011-5 673 000. © Copyright 2019 - Uga Escapes Management (Pvt) Ltd.